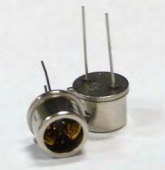 A new unique steady state black body infrared emitter in an industry standard TO-5 package with appprox. 2.4 Watts input power at up to 900°C (1173°K). It has no window and therefore emits the full unattenuated blackbody spectrum. Window options are available.